"Handle a book as a bee does a flower, extract its sweetness but do not damage it!" So when the other day, I came across an excellent blog exploring this very theme, I was inspired to share my own thoughts, as well as the blog I read, and the viewss I picked out which resonated with me. Indeed, the blog contained certain themes I touch upon in various pages on this website. I completely agree with this statement. Indeed, elsewhere on my website, I point out that fragmented habitats can cause inbreeding in bumblebees, for example. This is why what we do in our gardens, how we manage verges and hedgerows, what we do with public land (from parks and gardens, to strips of land outside council owned buildings etc) – really does matter in the grand scheme of things. Looking after eco-systems is not merely a done and dusted job completed by a few nature reserves dotted about here and there. Nor is it entirely the job of farmers. We are all contributing to the eco-system (or not) together. Indeed, and I agree entirely. Even removing a creature we regard as a “pest” can cause imbalances that might ordinarily be managed in a natural way by the eco-system itself, if humans were not interfering. And worse, our efforts can even be counter-productive to our original intended aims. For example, Adrianna Szczepaniec et al 2011: found that “Neonicotinoid Insecticide Imidacloprid Causes Outbreaks of Spider Mites on Elm Trees in Urban Landscapes” (You can read more about this theme here). To prevent mistakes, we should consider the interconnectedness of whole eco-systems, not merely tiny isolated fragments of it, especially considering that we know so little about the planet and the interworking and inter-relationships of the various species. “We must abandon the prevalent narrow emphasis on 'species of conservation concern' and start considering the wider assemblage of ecosystems as the organism - an organism of which we are not the masters but merely a part (albeit in some ways a powerful part). I have no idea who the scientist was, but I call the type of attitude exhibited ‘a sticking plaster’ approach to conservation, which again, I refer to in multiple places on my website. It's not enough to simply run around trying to stem declines of already seriously threatened species. Preventing devastating losses of wildlife and their habitat in the first place, has to be key and form part of any serious conservation aims. I would also add that I abhor any attempt to “normalise” wildlife and habitat loss, and to address the issue as though it is simply “the way of things” and an "inevitable trend'" which justifies the sticking plaster approach mentioned. I have seen this type of “shrugging off of responsibility” type of argument used by the agri-chemicals industry (and yes, I do know that reasons of bee decline are multiple) and I think we should refuse to accept it. So yes, today is a day for remembering the great web of life, and how tugging at a single thing in nature can affect the rest of the world. 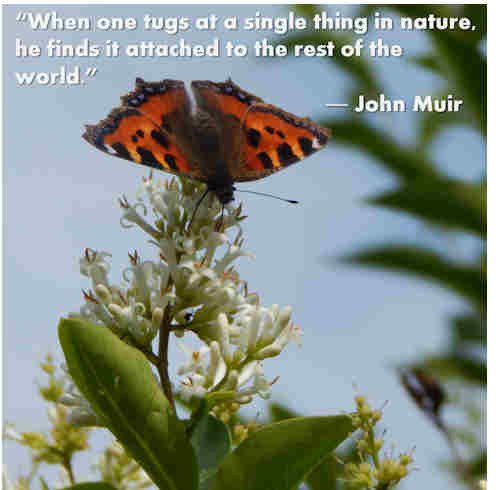 The more people on the planet who remember and act on this philosophy, the sooner we can put a stop to a reliance on 'sticking plaster' approaches to conservation, and genuinely protect the planet and its eco-systems for future generations.